As the fate of the clerical regime in Iran is tied to the veil (Hijab) of women, every summer they feel threatened by this force for change. This summer, too, the regime has geared up to control a situation which is increasingly getting out of hand with Iranian women undertaking bold actions to defy the state-sponsored compulsion of veil against their free will. 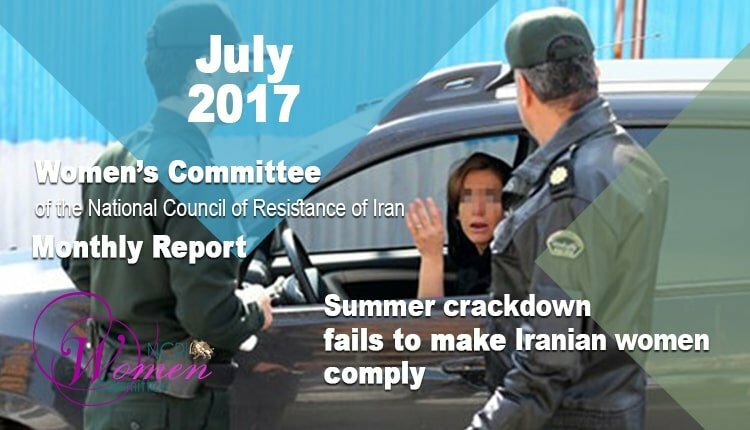 The month of July saw the regime’s rank and file mobilizing to confront women’s common practice of dropping their veils in their cars, while others dare to swim in the beach and even walk out in the streets without covering up. Preparations for the summer crackdown started in June when the Interior Ministry issued a directive to the Provincial Governors, giving them a calendar for inspection and evaluation of women’s observance of the rules on compulsory Hijab in government and private entities including hospitals, universities, offices, banks, etc. beginning on July 1. The directive was ensued by a blitz of announcements and declarations by religious scholars and a plethora of military and state officials threatening women with “harsh” treatment if they flout the rules on Hijab. In another instance, Khamenei’s representative in Mashhad, mullah Alam-ol Hoda, tied the regime’s economic crises to women’s failure to observe the Hijab. The Prosecutor of Mazandaran Province had declared that the Judiciary files cases against women who drop their veils in their vehicles, and they will have to stand trial by the Judiciary. At the same time, Bassij and State Security Force motorist patrols tasked with the suppression of women on the streets started their job in Qom. The SSF in Boushehr fenced up the area and set up billboards along the beach, prohibiting presence of women. As it can be construed from the announcements, threats, warnings, and measures undertaken, the problem the regime is currently dealing with is not improper veiling, but the dropping of the veil. The regime has become so sensitive in this matter, that they could not even tolerate women who were wearing long skirt instead of the chador (the officially recommended head-to-toe black veil). The dropping of the veil has become common practice to the extent that the regime’s religious scholars had to come to the stage to issue religious edicts. The Armed Forces spokesman and State Security Force commanders, Judiciary officials, security and intelligence officials, government ministries and parliamentary deputies all have collaborated to create the atmosphere needed by the regime’s forces to act. They even threatened to put women on trial for flouting the rules on Hijab. The mullahs’ law prescribes imprisonment of 10 days to two months for any woman who appears in public without the veil plus a cash fine of 50 to 500 thousand toumans. Women could also be punished to 74 lashes for “wounding public chastity” by appearing in public without the veil. Obviously, the threat to put women on trial is a clear effort to terrorize women and make them back down in their struggle to push back the official policy of compulsory Hijab. Nevertheless, the state-run press published the pictures of a defiant woman bravely walking around the city of Boushehr with just a T-shirt and tight knee-length pants. The woman was later identified and arrested by the SSF and declared “insane” to prevent other women from following suit.